It’s very rare that a professional athlete ever goes out on top. Most of the time, they’d be lucky if they’re afforded the opportunity to go out on their own terms. 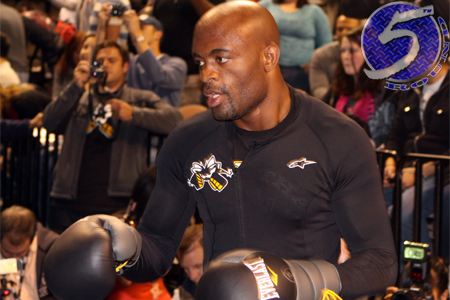 Unfortunately for former UFC middleweight champion Anderson Silva (pictured), he likely won’t get the chance to do either. In the most anticipated rematch in UFC history, Silva was nearly TKO’d by champ Chris Weidman in the opening round. Fortunately (or unfortunately) for “The Spider,” he weathered the storm and the bout went into the second stanza. It looked like Silva was starting to open up his arsenal until unleashing a fateful kick that changed EVERYTHING. Weidman checked the strike and snapped Silva’s left shin in two. The fight was stopped immediately. It was one of the most gruesome and graphic injuries any sport has ever seen. At 38 years of age, two straight losses to Weidman, nothing left to prove and an extensive rehab ahead of him, it’s possible Silva will never fight again.